Get your hands on this big, handsome, powerfully built writing instrument that are perfect for anyone who likes a more substantial pen. Putting your signature on one of the Big Ben pens is as easy as choosing your favorite material. Blank Size: 3/4" x 4-1/2"
Note: Pen Kits Only, Pen blanks not included. 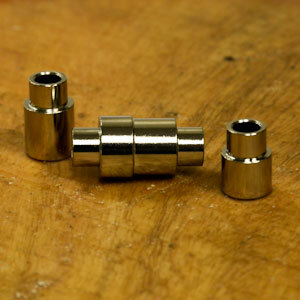 These bushing are for Big Ben Cigar Pens twist & click pen kits. Brad point drill bits are the best choice for drilling wood and these drill bits are perfect for drilling pen blanks. High Speed Steel for accuracy and sharpness, and feature extra long center point. The center point is actually a continuation of the flutes and bores rather than being pushed through the work piece. The 10mm" Drill Bit are needed for Big Ben Cigar pen kits.